Three games played. Five out of a possible six points. In a perfect world, this sort of outcome would be the product of a well-written script, executed to perfection. Given the sort of change that the Florida Panthers underwent this offseason — impacting both on-ice talent and front office personnel — it wouldn’t be a stretch of an assumption. And yet, things haven’t been so cut-and-dried. 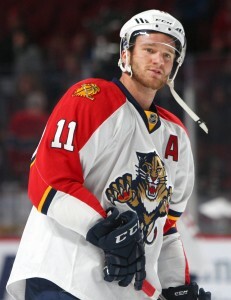 Lacerated by an errant skate blade during the club’s final preseason tune-up, star-winger Jonathan Huberdeau’s injured left ankle will shelve him for the next three to four months. As if that wasn’t bad enough, his absence affects an already depleted forward group, one that was bracing for hulking pivot Nick Bjugstad’s extended absence due to a broken hand. Two offensive threats nullified without so much as suiting up for a regular season tilt. But somehow, Florida has managed to win early, posting the league’s second-best Corsi For (56.65%) and Fenwick For (57.55%) percentages in the process. What’s more — the Cats have averaged three goals per game so far, and have played well in front of goaltenders Roberto Luongo and James Reimer. But for all of the holdover from last season’s division-winning squad, their fresh talent is responsible for this quick success. And if players like Jonathan Marchessault, Colton Sceviour and Mark Pysyk continue to play to their potential, Florida could emerge as a legitimate threat in the Eastern Conference. On the eve of the 2016 NHL season, nobody expected Colton Sceviour and Jonathan Marchessault to be powering the Panthers’ attack. After all, neither skater had played extended minutes in a top-line role before — the former skated as a bottom-six player, reaching the ten-goal plateau just once prior at the NHL level, while the latter ping-ponged between the Tampa Bay Lightning’s major league club and their farm system in Syracuse. Thrust into a first-line role in Huberdeau’s stead, Marchessault has gelled well with linemates Aleksander Barkov and Jaromir Jagr, chipping in on the offense to the tune of four points through three games played. While based on a small sample size, the 5-foot-9 winger is driving possession at an absurd rate, registering a Corsi For percentage of 72.3%, over ten percentage points higher than his impressive career mark of 60.8%. 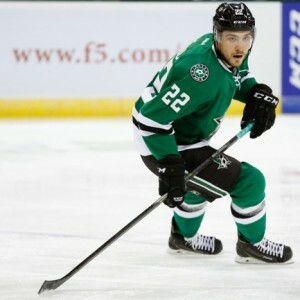 Sceviour has also performed admirably as a driver of possession; and while his goal-scoring rate figures to experience some form of regression as the year wears on, his Corsi For percentage of 64.3% identifies a player with a penchant for keeping the puck in the offensive zone. A career plus-player in terms of advanced metrics, the sturdy 6-footer could be expected to continue that trend. And, with both skaters on pace to whip over 200 shots each at opposing netminders, Marchessault and Sceviour stand to eclipse the 20-goal watermark, should they manage to meet their career shooting percentages. Allowing 1.67 goals per game is no small feat, and starting the year on a three-game perfect penalty-killing streak is nothing to trifle with. Tasked with repelling the opposing attack, four new faces have locked down the Panthers’ own zone, repaying management’s faith in selecting them to helm a new-look defensive corps. However, one of them, Mark Pysyk, has shined just a bit brighter. 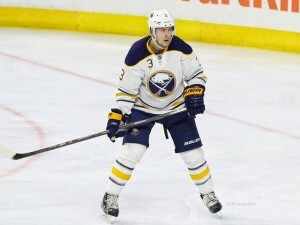 Snagged from the Buffalo Sabres in return for Dmitry Kulikov, Pysyk, a former 2010 first-rounder, has lived up to his billing as a puck-possession rearguard. According to Hockey Reference’s advanced metric charts, the 6-foot-1 native of Sherwood Park, Alberta, appears to be building positively off of a 2015-16 campaign that saw him generate a Corsi For percentage of 51.8%, notching a 71.4% in the opening stages of the new season. But, perhaps surprisingly, Pysyk’s managed to play a sound game in his own end as well. Suppressing shots at a solid clip, he’s composed half of a shutdown pairing with bruiser Alex Petrovic, allowing a single scoring chance through his first two games in a Panthers sweater. His defensive work is understated — according to TSN, Pysyk was a top-2o blueliner during the 2015-16 season in terms of preventing high danger scoring chances. Additionally, that performance comes at a bargain. The Panthers are currently shelling out $1.125 million for the 24-year-old’s services, the third-highest cap figure tied into a defenseman on the squad. At the end, though, it all boils down to chemistry. Whether or not these players can sustain their success revolves around their ability to play with their new teammates. And if head coach Gerard Gallant is to be believed, things are well on the right track. “They’re all skilled players and they’re quick players. The first two games have been great. We’ve had a lot of opportunities to score in both those games. Everything’s clicking,” he said in an article published by the Sun Sentinel.